This entry was posted on June 11, 2018 at 5:20 am and is filed under East Village, Gramercy/Murray Hill, Lower Manhattan, Music, art, theater, Transit. You can follow any responses to this entry through the RSS 2.0 feed. You can leave a response, or trackback from your own site. Ephemeral strikes w/ new knowledge again! I had never heard that they were modeled after ones in Budapest. That makes sense – looking at them now. They have an Eastern European look about them. I always assumed the ones in existence – such as at Astor place – were originals not replacements. I’m not sure if they qualify as Art Nouveau, but that was the style popular in Europe at the time. I’m confused. You could only enter through the domed kiosk, you couldn’t exit through it? You could only exit from the peaked kiosk, it wasn’t possible to enter through it? 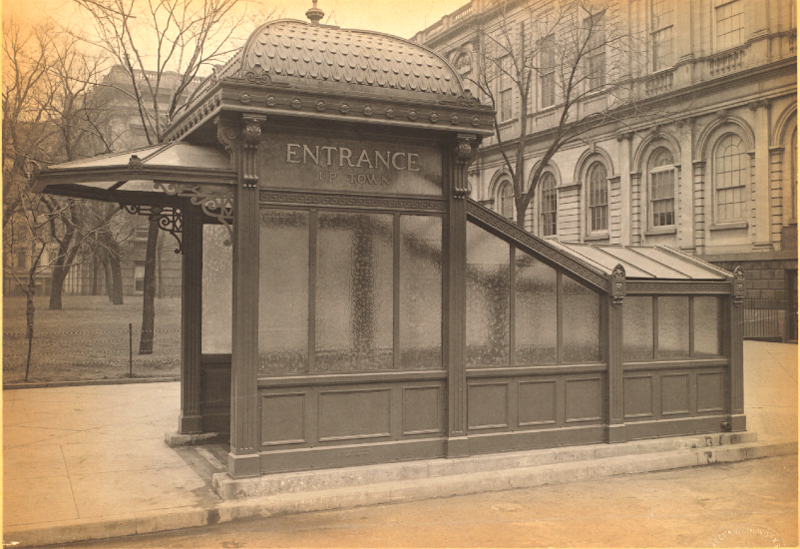 Yes – there were dedicated platform entrance and exit staircases. “On each platform were four stairways, two for entrance and two for exit, divided by metal gates operated by an attendant who controlled passenger flow.” ibid. The style was more a pure form of Beaux-Arts than Art Nouveau. Note that the kiosks with round tops are entrances and the ones with pointy tops are exits. I found the kiosk at Astor Place after it had been delivered, and noted that the four hooks that held the wires that held the kiosk in place had been sawn off the kiosk. I promptly liberated them in the name of the Crown and took them home. I met up with him again. He told me was using one as a paperweight on his desk. I showed him some information about the companies that made the kiosk and suggested he could send the other three to their top honchos, to thank them for their work in restoring this piece of history. He thought that was a good idea. After the kiosk was opened, I took my father to see it, as he used them all his life. He studied it judiciously, walked around, inspecting it, and tapped its sides. Finally he said, “Yes, this is what they looked like. 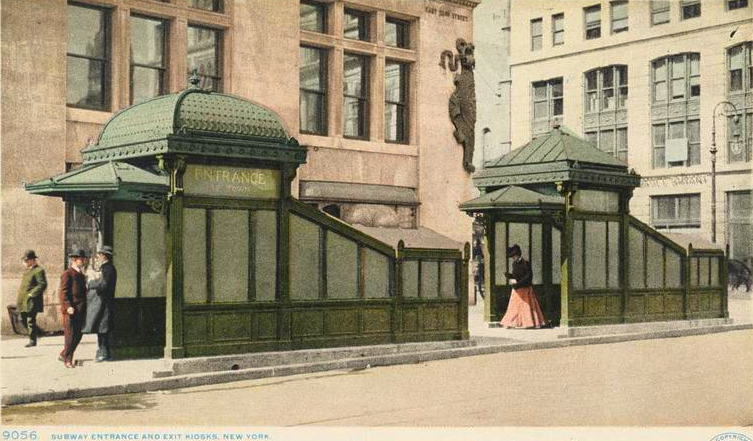 But I never knew that Astor Place had a double-size kiosk.” He was very pleased. I don’t get up there much, but doesn’t Columbus Circle have a similar entrance? No, it doesn’t. Have not seen one at Columbus Circle or any other station (except the replica at the Astor Place station) and I’ve been here 50+ years. Aside from the elevator at Brooklyn Bridge and the one discussed at Astor Place, they’re all gone. The last survivors were at 50th Street and Broadway.